The updates certainly appear to favor iOS users today, with the biggest changes happening on iPhone and iPad. In addition to new photo editing features, including the Snapseed filters mentioned above, the iOS app also has new profile designs, a new notifications tray, a better setup flow for new users, and the ability to control the volume of posts in your stream. If you’re an Android user, you’ll see a lot of the same features listed above, but you won’t see the photo editing options. There’s another feature exclusive to Android, however, which is the ability to share your current location on your profile. If you choose to use this, you can control who sees it in the app’s settings menu. 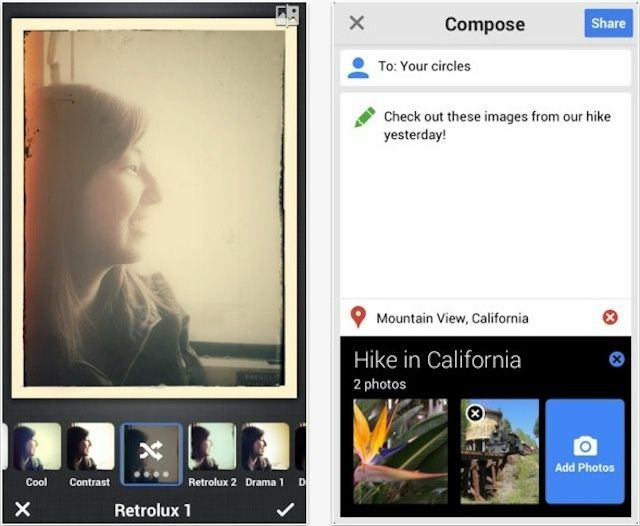 The latest Google+ releases for Android and iOS can be downloaded from the App Store and Google Play now.